With Snooker, pinpong, Toto and many other games. Vista that enables the sea and the total area of the hostel. A beautiful atmosphere for those who like to relax by the pool. Service bar for those who like to enjoy the pool the night or day. Church take the second entrance on the left. On accessing Imbassa. there are various indicative signs of all the inns what facilitates the access. 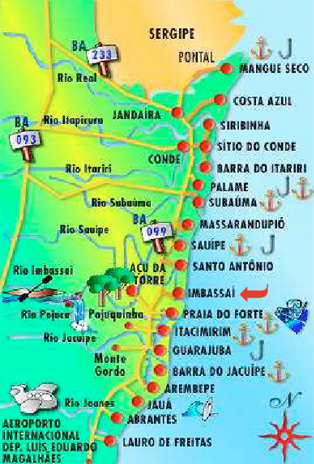 If you come by car from the north country through BR 101, follow through “Linha Verde”(Green Line Road) and pass through Mangue Seco, S.tio do Conde, Barra do Itarir., Baixios, Suba.ma, Massarandupi., Porto de Sau.pe, Costa do Sau.pe Resorts and 10 kilometers after it, you arrive to the entrance of Imbassa. (071-3450-4004) and “ Linha Verde” (071-3450-0321) before travelling. If you come by car you should check the route that takes you to the “Linha Verde” (BA099), either from BR-101 or BR-324. If you come by plane, you can take a taxi to the inn or contract the transportation with a receiving tourist agency.